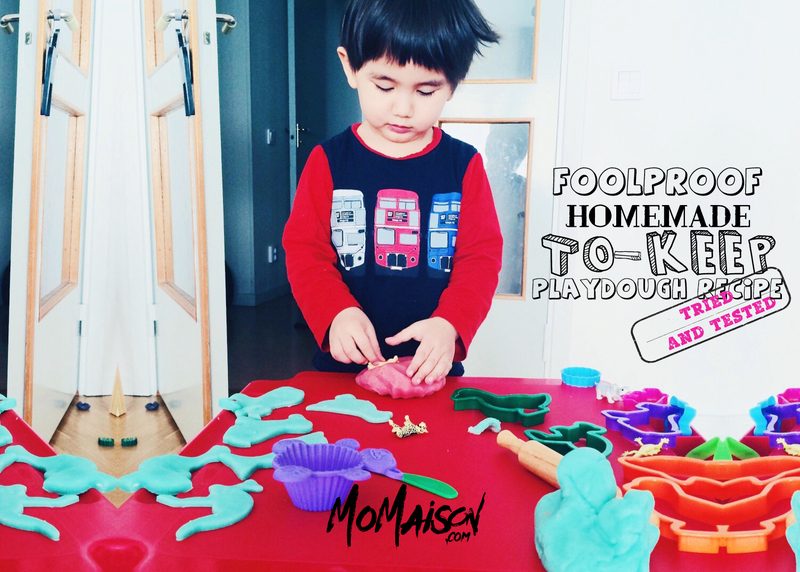 I have tried many different homemade playdough recipes from online resources and a lot of them failed badly. Some turned out fine but the consistency and feel of it just didn't feel right. Most of them just didn't turn out to feel like a store bought one. One made a lot of mess, one oozed out all the oil after being kept in an airtight jar for awhile, one was too dry and had no elasticity i.e. it can't be rolled out with a rolling pin, one would stick to the fingers easily and one smelled really bad, specifically reeking of vinegar. All those that failed, I followed recipes (that claimed it will turn out like store bought ones) provided online. I thought that if I followed the recipe to a T, it would turn out perfect. Well, I thought wrong. For the playdough to have the perfect consistency, most people commented that cream of tartar is the vital ingredient. Until now, I still have no idea what cream of tartar is and where I can find it in Sweden and I just didn't bother to find out haha! So, I decided to find out what makes a good substitute for it instead and discovered that lemon juice/white vinegar could do the trick. 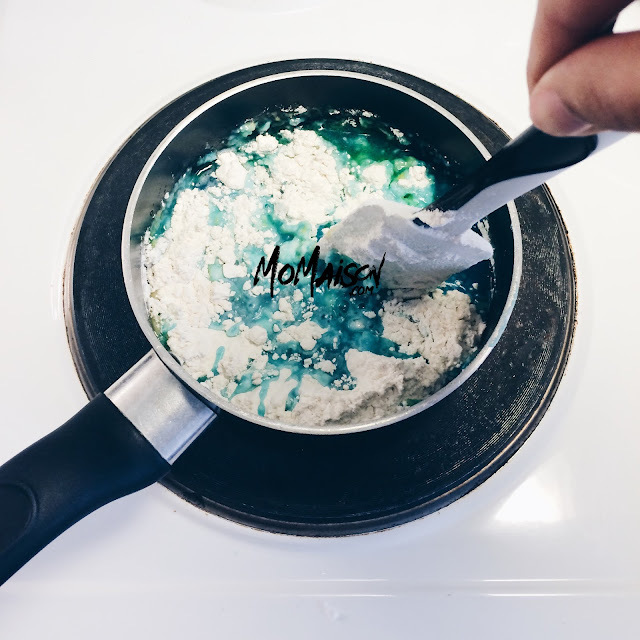 After a few failed attempts of other recipes, I stumbled upon recipe #1 from We Love Being Moms' post here. I tried once with vinegar and although it turned out fine (other than many tiny little clumps I didn't work on), it stank badly Daniel couldn't tolerate the stink he threw it in the trash hahaha! I then tried it with lemon juice. It worked! But I made it easier by improvising the recipe after learning from mistakes with the first attempt with the vinegar. 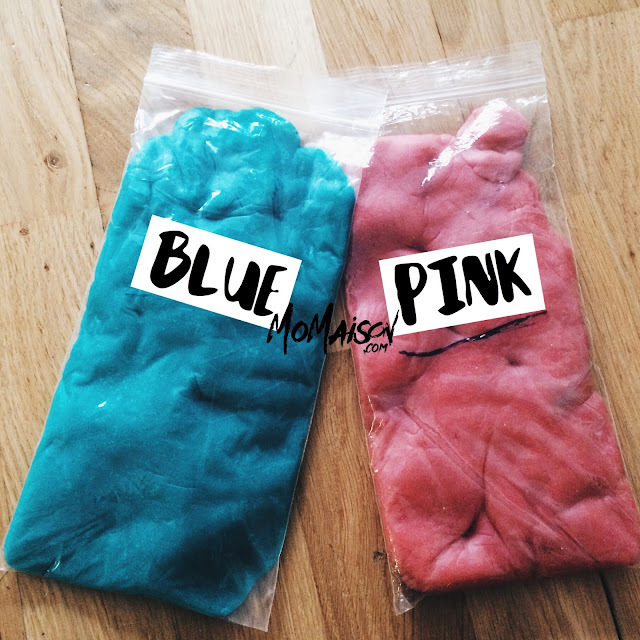 After 2 successful batches of like-store-bought playdough, I decided to share the recipe on my blog! 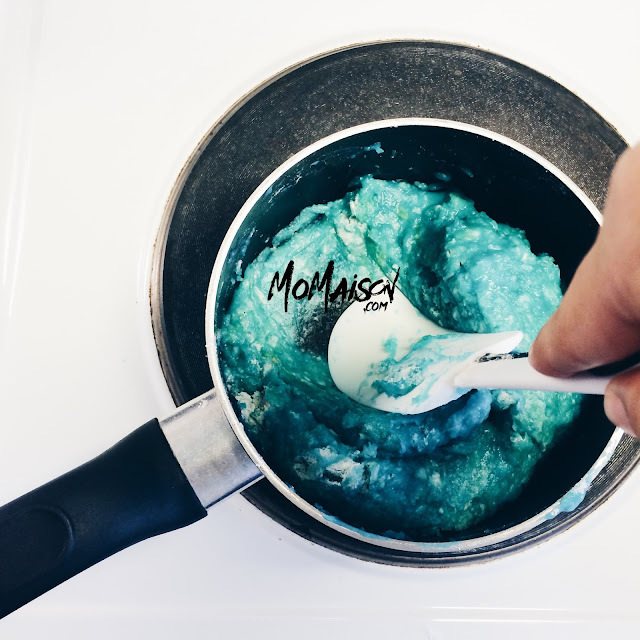 Add water, food coloring, vegetable oil and lemon juice into saucepan. Stir and mix well with spatula over high heat. Mix salt in and stir well until salt dissolves. Pour flour into the mixture and mix well. It will take a lot of patience and strength but keep mixing them together until combined. 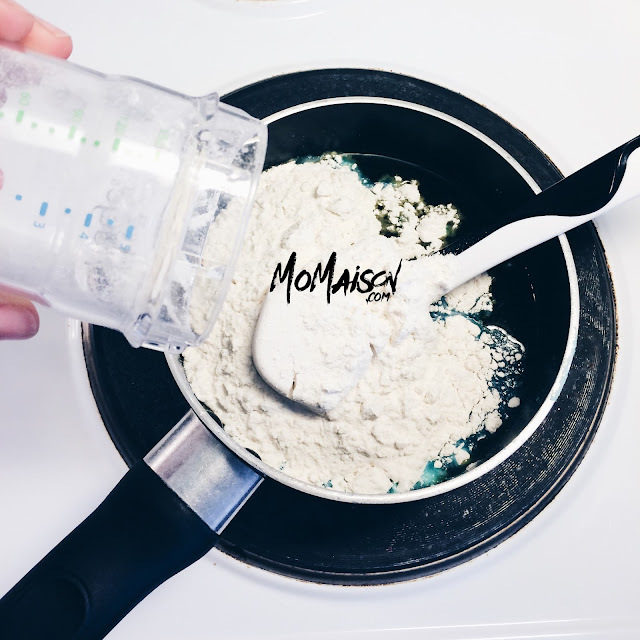 When you cannot see anymore dry flour, turn down to low-medium heat. You will see a lot of tiny white clumps in the dough. Use the spatula to press down hard on the clump and spread it across the base of the pan like spreading hard butter on bread. Keep repeating it until there are no more visible little white clumps. This is the most tedious step which requires patience and strength too, but the finished product will make it all worth it. Turn off heat and let it cool till warm to touch. Take dough out from the sauce pan and knead on a hard surface. 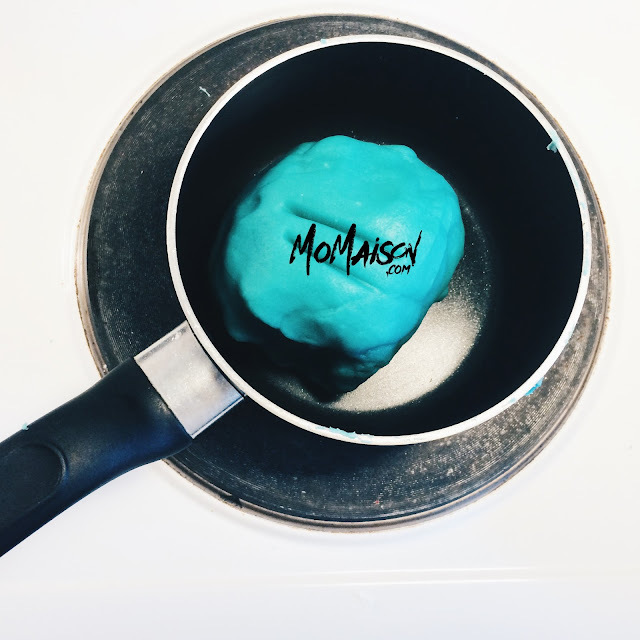 Your homemade playdough is done! Store it in a ziploc bag, removing air before sealing, for long storage life. There you have it! If you follow this recipe to the T (measurement and all), it should turn out PERFECT! Without the need of cream of tartar and not smelling of vinegar! If you are going to try this recipe, please leave a comment if it did work perfectly, or if it turned out a mess and does not feel like store bought ones at all. I really would like to know if this is the perfect recipe or does it depend on the pan, stove (flame vs induction), ingredients (quality or different kinds eg. canola oil vs palm oil) or any other possible factors. Share it with fellow parents too, if this recipe was perfect for you! Best playdough ever! Like store bought! 1. 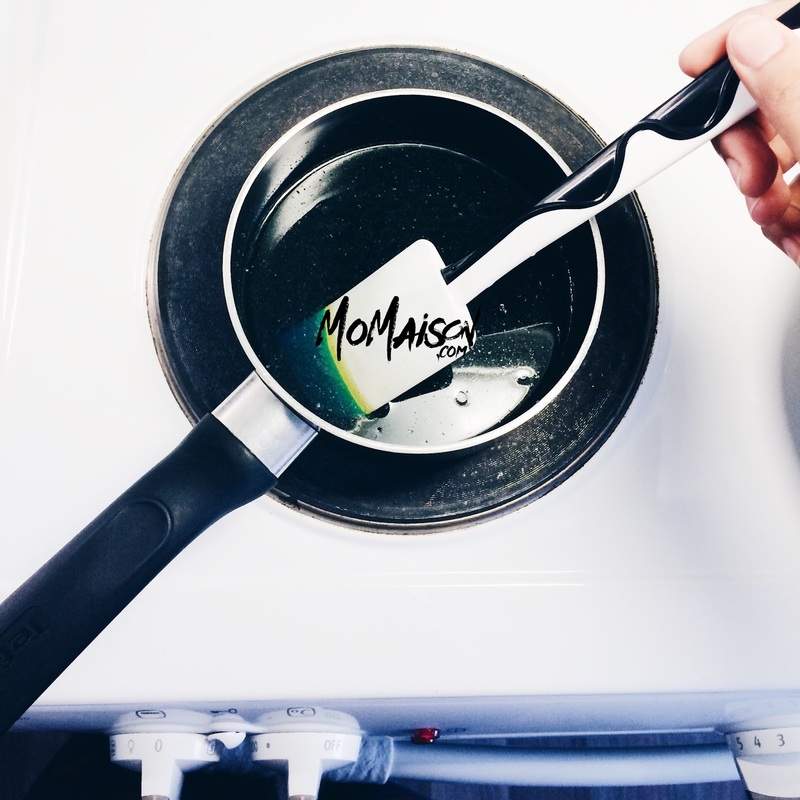 Add water, food coloring, vegetable oil and lemon juice into saucepan. Stir and mix well with spatula over high heat.2. Mix salt in and stir well until salt dissolves.3. Pour flour into the mixture and mix well. It will take a lot of patience and strength but keep mixing them together until combined.4. When you cannot see anymore dry flour, turn down to low-medium heat. You will see a lot of tiny white clumps in the dough. Use the spatula to press down hard on the clump and spread it across the base of the pan like spreading hard butter on bread. Keep repeating it until there are no more visible white little clumps. This is the most tedious step which requires patience and strength as well, but the finished product will make it all worth it.5. Turn off heat and let it cool till warm to touch. Take dough out from the sauce pan and knead on a hard surface.6. Your homemade playdough is done! Store it in a ziploc bag, removing air before sealing, for long storage life.